Jambo Everyone: Kungaloosh! Bring the Adventurer’s Club to the Animal Kingdom! Kungaloosh! Bring the Adventurer’s Club to the Animal Kingdom! The history of Disney parks is replete with fans longing for the days of old. Extinct attractions are often brought up by fans in a "i miss....." sort of way. We know them all. Mr. Toad's Wild Ride, the old Animation tour at Disney MGM Studios, Horizons (I miss Horizons) are often spoken of and many even have their own web sites and fan clubs (especially Horizons). One that often tops the lists of things from yesteryear is the Adventurers' Club from Pleasure Island. Unlike the dance clubs that existed there, the Adventurer's Club was pure Disney. 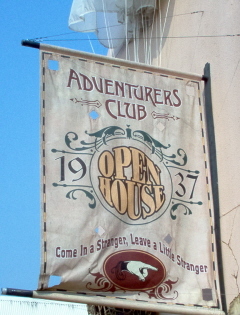 For those that don't know, the club itself was supposed to be set in the mid-1930s and was for explorers. The place was covered in artifacts and pictures from the members' various travels. But the fun did not stop with the decor. The place also featured various animatronics, puppets and numerous hysterical actors and actresses wandering about mingling with guests in their roles as club members. Even the rooms had their own personality. There was the Zebra Mezzanine, The Main Salon, The Mask room (my favorite), the Treasure room, and the Library, where many of the scripted shows were performed. The shows were a highlight of the club for many guests. These included Samantha's Cabaret, the New Member Induction, the Welcome Party and the Hoopla which ended the evening. And, of course, there was Colonel Critchlow Suchbench who was a puppet in the Main Salon that would "come to life" and mingle with guests periodically. Like all of Pleasure Island, the place shut down on September 28, 2008. While many mourn the loss of other portions of Pleasure Island (especially the Comedy Warehouse), none come even close to the uproar involved with the loss of the Adventurer's Club. Within 72 hours, nearly 3000 people signed an online petition to save the club. There was a letter writing campaign, and numerous blogs and websites set up to save it or at least remember it. There is no doubt in my mind that the Adventurer's Club, if brought back, would be a huge success and public relations bonanza. Just imagine for a moment, the excitement and buzz if this was announced at a D23 event. But where should it go? Well, this is an Animal Kingdom site, so I think you can guess where I am going with this. Here's why I think the Adventurer's Club is perfect at the Animal Kingdom. First of all, one the prime imagineers behind the club was Joe Rohde, Mr. Animal Kingdom, himself. Also, I think I read somewhere that the Magic Kingdom is the park of fantasy, that Epcot is innovention, the Studios are magic and the Animal Kingdom is the land of adventure. And that is so true. The theme of the club fits well with the decor of Dinoland, with the ruins of the Maharajah Jungle Trek, and with the town of Harambe. I would take out the Rainforest Cafe and replace it with the club as a new gateway to the park. At that spot, it could even stay open well after the park closes. This is not to say that the Adventurer's Club can be brought back in its identical form. First of all, some of the banter amongst the personalities could be a touch risque. Secondly, I would think the club would have to be redesigned to a degree. I would want a menu, so it would become a lunch and dinner destination. The shows, such as they were, could be conducted in different rooms during the course of the day. Perhaps the library would be larger and be the area where one dines. with shows every hour. The other rooms would be for the bar crowd and maybe a more limited menu. The food would reflect the club, different cuisines from the corners of the world. Gifts brought back by the club members from their trips. I would think this would be a huge asset for the Animal Kingdom. A truly different yet old, experience for new guests and seasoned Disney veterans.